posted by andrea at 8:32 a.m.
Andrea...this is stunning. How big and how much??? Any connection to Celtic Trees? 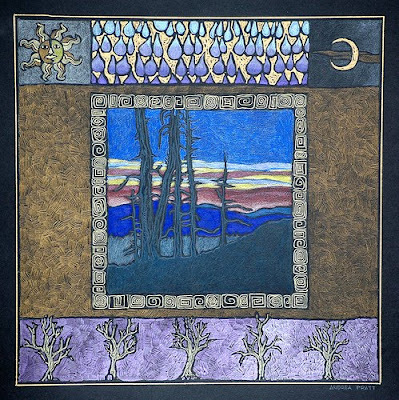 Melody: 10.5" x 10.5" image size, made for a 20.5" x 20.5" x 2" frame. It's on its way to Effusion Gallery where they sell for $350. Dinah: Only in format concept/medium, not in theme or subject matter. Solar cycle, sun and moon, changes of season ... kinda gets your juices flowing don't it? So well I remember that evening on Sherman's Pass. Awesome sunset. The day we met Coco.